UPE Menu Show search box. 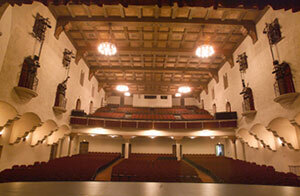 CSU, Chico's venerable Laxson Auditorium celebrated its 80th year of operation in spring of 2011. Built in approximately thirteen months (original blueprint drawings are dated February 24, 1930 and construction began on May 2, 1930) at a cost of $288,703, the auditorium has been the site of thousands of performances, debates, speeches, graduations, and ceremonies. Each year, Laxson Auditorium hosts more than 100 performances of artists from around the world in music, dance, theater and lectures. Nobel Prize recipients Mikhail Gorbachev, Desmond Tutu, Jody Williams, Shimon Peres, and notable speakers Jane Goodall and Garrison Keillor have graced its stage. Chico State has hosted renowned performing artists ranging from Yo-Yo Ma to Lily Tomlin, Willie Nelson to John Cleese, k.d. lang to B.B. King, Jackson Browne to Joan Baez, and the San Francisco Symphony to the Martha Graham Dance Company. In addition, hundreds of Chico State theatre, music, and dance students have "trudged the boards" in performances ranging from musical comedies to serious drama to classical music, jazz, modern dance and salsa. The first event held in Laxson Auditorium (according to the Chico State Wildcat newspaper) was an assembly on June 4, 1931 to install the new student body officers, including President Melvin Farley. The assembly included a band concert that featured John Philip Sousa's "Liberty Bell March," "Home Sweet Home," and the Chico State fight song, "Hail to Chico State." Activities continued that week with the first major performance production on June 9 of Bohemian Girl (featuring sixty-four singers and a twenty-two-piece orchestra), directed by Ruth Rowland (later Ruth Rowland-Taylor), and graduation ceremonies on June 10, 1931. The official dedication of the then named Assembly Hall was on January 22, 1932 during the inauguration ceremonies for Chico State President Aymer J. Hamilton. Assembly Hall later became known as College Auditorium and then University Auditorium. It was officially re-named Laxson Auditorium on Sept. 25, 1974 honoring Dr. C. Robert Laxson, a music professor at the University from 1946 until his death in 1968. A two-year (1974–1976) $1 million earthquake proofing renovation resulted in a new seating configuration reducing the capacity of the facility from 1,470 to 1,337. The renovation was accompanied by the addition of plush padded seats (replacing the often splintered wooden seats) and carpeting. The "new" Laxson Auditorium was officially dedicated on December 9, 1979 in ceremonies emceed by Harlen Adams and presided over by University President Robert Fredenburg. Laxson Auditorium underwent a complete renovation in the summer of 2006, including newly refurbished seating, new carpet, a refinished stage floor, lighting and sound equipment upgrades, and an updating of the backstage dressing rooms.